Traveling for three weeks or more? All you need is a carry-on bag. Really, it’s true, it can be done. 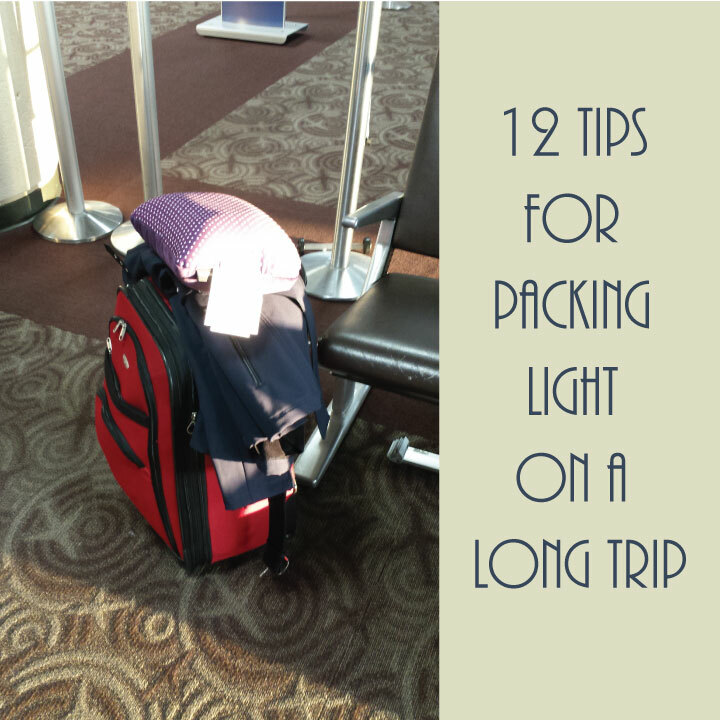 And once you have packed that light for that long of a trip you will never travel with more than a carry-on again. It takes some planning and some practice to master packing this way, but it is well work the extra effort. You will thank us even more if your trip involves lots of travel while you are on it. 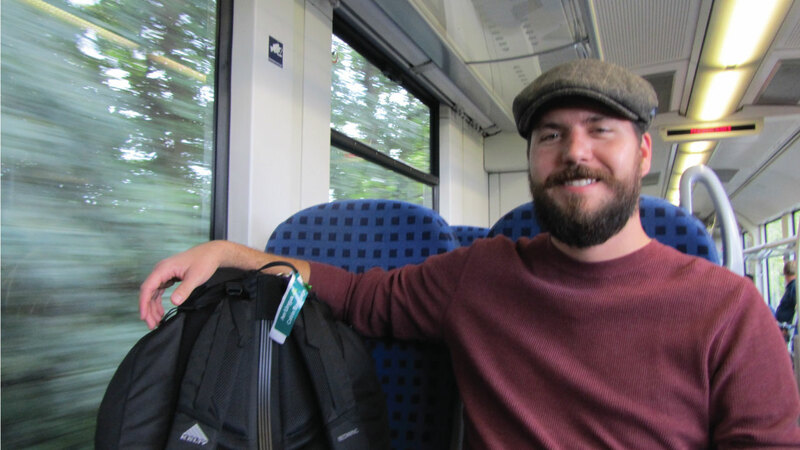 While we were in Europe this past September it was nice to only have one bag to deal with while hopping on and off trains while traveling to other cities and countries. Here is how we did it and yes we will include tips from Noah to get a guy’s perspective on this as well. Plan, Plan, Plan. Really think about your trip and what you have planned. What types of clothing will you need? Casual, nicer, active? Will you be eating anywhere fancy, will you be hiking, what types of dress will be required of you and how many nights/days of each will you have? Gather and layout everything you think you might need. Then get ready to put half of it back, trust us, you do not need it all. The key to taking less clothing is choosing items to mix and match. Select a few basic bottoms. We were gone for three weeks so I took 2 pairs of jeans (one dark blue and one grey) and 3 maxi skirts (one black, one grey, one navy blue). To be completely honest, I never wore the blue one, wouldn’t pack it next time. Jeans you can wear a few times before they need to be washed so you can mix and match that a lot (or shorts, just think of the weather and time of year you are traveling). Now pick out a mix of tops, take enough for about half your trip. I took a mix of short sleeve, long sleeve, sleeveless, and ¾ sleeve tops. This way I was ready for any weather and able to layer if it gets cold. I also took on black cardigan. Now I could change up any look if the weather was cold or for nighttime. I instantly had several new looks. Guys, you pack the same way, jeans and a pair of dress pants. Mix t-shirts and collared shirts. Pack one button down shirt for if you need to dress up a bit. Unless you know you will be in a place that requires a tie and jacket, don’t bring them. You can most likely get away with a nice cardigan to dress up your look and make it suitable for a nicer location at night. My fiancé brought along one of his grey grandpa sweaters and it worked great for everywhere we went that was a little nicer. It is an easier piece to pack and won’t wrinkle like a jacket will. Look at what you have gathered. Remove any pieces that only look good one way. You can only wear those once so put it back. Make sure you choose tops that look good with jeans, but also look good with a skirt (or that one pair of dress pants you packed if you’re a guy). You want to be able to look casual, but dress something up enough that you can go to nicer places if you want. Bring a couple accessories that dress it up a bit too. Just carrying a different purse or putting on some nicer jewelry will do wonders. Only a few things though, that is all you need. Noah tip: Guys if you need a tie, they do not take up much space, you can roll it and put it in your bag or just buy a nice tie there if you end up needing one. DO NOT BRING OPTIONS. We all do it while getting ready to go on a Saturday night, try on 5 different outfits and then try different accessories. Do this while packing, make a decision, and take only one. You don’t want to waste all your time in the hotel trying to figure out what to wear our anyway. Know what you have, put it on and get out there to do fun things. Take 2 different pairs of walking shoes. Make them different styles so if one gets uncomfortable on your feet one day you can give your feet a break and wear the other pair the next day. I myself brought 2 pairs of shoes for walking, one packed and one on my feet the day we left and a pair of black flats. The flats were for when we wanted to be a little dressier. Flats were key because I did not want my feet to hurt, and we were in Europe, lots of uneven walking there so it is just easier and flats can be just as nice as heels. Noah Tip: Make sure to bring shoes that breathe. Get insoles with cushion and support, it will save your feet. Pack plenty of socks and undergarments. These are smaller items that can be stuffed inside shoes and in open areas of the suitcase. You can wash these, but in case you run out of time make sure you have enough of all these. We were glad we brought enough socks since it rained a lot of the time. To make space in your suitcase as you go bring the old ones and throw them out as you travel freeing up some space for things you buy. Best Option – A small backpackers backpack that is sized to carry on the plane. It is great for train travel as well. The idea is to carry on so bring only the allowed small clear bag of liquids. This means shampoo, conditioner, body wash, and hair product. It does not matter where you are traveling you do not need to pack a lot of this. The hotels with have soaps and shampoos. If not go buy some at a store when you get there. We never needed to. I took a hair product that was multipurpose for the trip so I could use one product to do all the different styles with my hair. Bring something to make your hair last so you can skip washing it a few days. It saves on time and what you need to bring. Pack a travel sized laundry detergent. This way you can wash some clothes as you go. Wash in the sink or shower and hang to dry in the hotel room. If your trip is long enough and you have the time you can hop into a laundromat and wash everything one morning. If you don’t want to waste a few hours doing laundry then you have two options. Some hotels have a laundry service; you will pay dearly for this so that is up to you. Or, you wash clothes yourself and hang them to dry in the shower while you are out seeing the sites. It is quick and easy to do and worth doing to pack less. Noah Tip: Bring some Ziplocs of different sizes. This works great to put leftover detergent in without it getting all over your bag, you can also use it to put wet clothes in for travel, maybe something isn’t quite dry yet or maybe the rain soaked you the night you have to pack. They don’t take up a lot of room, but will come in handy at some point. Bring a couple old plastic shopping bags (or shower caps if you have them) to cover wet or dirty shoes. In addition to your carryon you can have one personal item. Do not make this large; you have to carry this with you everywhere too. I chose a messenger bag. It was a great option. I take this in lieu of a purse. Its great while out seeing the sights as you can throw it over your shoulder or across your body to make it secure while you are out and about. It is lightweight, but still large enough to hold anything you may need. You can keep your camera in there and there is room to add things you buy throughout the day if needed. Noah Tip: This will also hold a compact umbrella. If you get one like Emily has it isn’t girly looking so it looks fine for a guy to carry. This way I could help out lugging things around if it got heavy for her. Noah Tip: Everyone has a million devices to charge these days. If you are traveling as a couple like we were you most likely have 2 phones, 2 cameras, and a tablet that would need to be charged. DO NOT BUY MULTIPLE CONVERTERS. All you need is one converter and a surge protector with multiple outlets. This was the best thing we did, it saved space and we had a spot to charge everything at once if we needed too. Trust us, this works great. Noah tip: Send things you buy home. It really wasn’t that expensive to send what we bought home. This way you do not have to worry about breaking things as you travel or lugging everything with you the rest of the trip either. We sent a few boxes home. We also saved space in our bags this way. For example, if you buy a shirt or some sort of wearable souvenir, decide if you will wear it on the trip, if so send home something you won’t be wearing. Use the clothes you send home to wrap breakable items and use them for packing. In the long run, would you rather lug it around or send it home? We tried to lug some fabric around that Emily bought in Paris and by the time we got to Germany we just sent it home because it was heavy to travel with. Well worth the minimal cost of sending it home. Now this may seem like a lot of stuff, but if you narrow down your options, take half of what you would need and wash clothes partway through the trip then this will all fit in a carryon. Stuff things inside your shoes and make sure to roll all your clothes. This makes more space and helps keep wrinkles to a minimum. Still worried about wrinkles, thrown in a Downy Wrinkle Release travel size, we used it the entire trip to get wrinkles out of the clothes and it works great. Get the kind with Febreeze and it will freshen your clothes as well. This can be good if you spend a lot of time sitting outdoors at cafes where people are smoking. Roller bag vs. Backpack – Take the backpack if you can. Rolling a roller bag on old cobblestone streets and sidewalks like you see here is not an easy task. Packing like this can be done I have spent an entire month and another 3 weeks in Europe with just a carryon. I packed even less the second time I went. 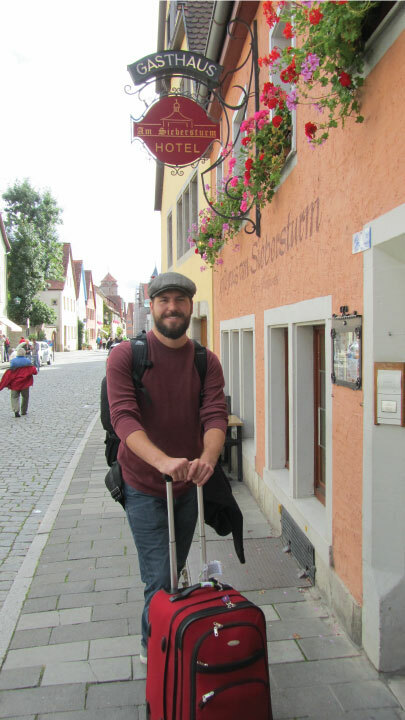 I had a roller bag, but if I did it again I would take a backpackers backpack like Noah had. It is much easier to carry while walking from train stations to hotels and hopping on and off trains with. If you can get a backpack, do it!